The Maeldune Heritage Centre is located at the top of Market Hill at its junction with the High Street. 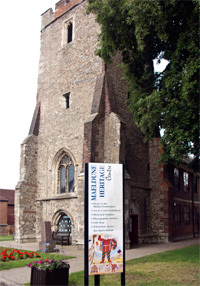 The entrance is in the old tower of St Peter's Church and it occupies the ground floor of the Plume building which was once Maldon's Grammar School. On the wall of the centre you will find the Maldon Embroidery, which was made to celebrate the 100th anniversary of the Battle of Maldon. Designed by Humphrey Spender, it illustrates Maldon's history from the Battle in 991 to its anniversary in 1991. This work measuring 42 feet in length, took three years to complete and involved the work of over one hundred people. There are also local history exhibits and the centre holds the computerised image archive of the Maldon Society which contains over 3,000 digital images recording Maldon's history over the last 100 years or so. Access to view the images is free and prints of many can be purchased. You will also find a gallery which frequently hosts a programme of exhibitions, primarily by local artists, displaying their work in a variety of disciplines including painting, textiles, pottery, jewellery, photography and wood-turning. The Centre also holds occasional craft fairs and open art exhibitions. In the entrance to the Centre you will find a gift shop offering works by local artists for sale along with other interesting items. See their website for details.